Up above, the capital city of Marada shines in the morning sun. It's inhabitants stroll around enjoying the clean streets and fresh air. How is it kept so clean? Why because by the marvels of modern engineering all the muck and filth is washed down here of course! Welcome to the City Sewers - the smelliest, unhealthiest, most disgusting place in the whole of Marada. Bring your trap items to the crevice to see what bugs you can catch. Complete goals related to City Sewers and receive a prize at each level. Treat your pet to some mutant food - it's nasty, but gourmet! Help Cornelius block the flow of sewage into his house and win the jackpot. Swim in the Sewage for free every 24 hours to see what you can find. 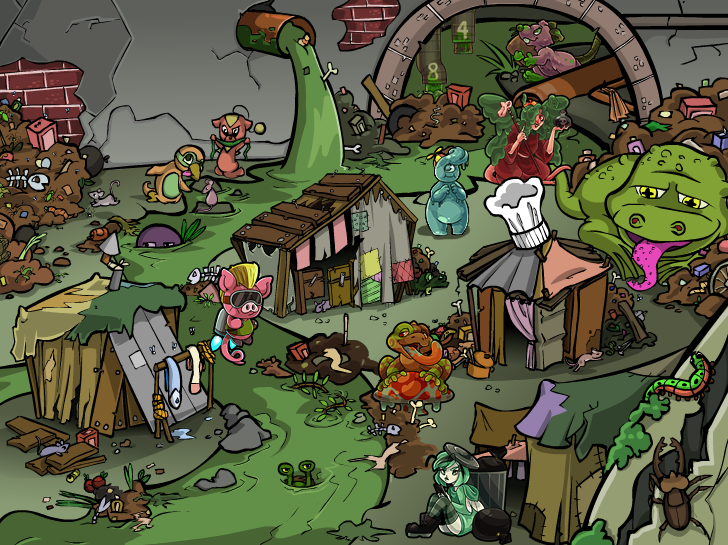 Complete the 30 levels of the Sewer Cleaner missions for a Basil pet. The Sewer Fairy rewards you for how many posts you make on the Forums. Complete the Sewer Monster quests for the food that he wants and be rewarded. Complete the Sewer Pipes Treasure Map and your pet can ride the sewer pipes. 500BP to help Septic dig and battle through the sewage and see what you can win. Slime Boy rewards each of your pets for increasing their charisma stats. The SPAM Fairy rewards you for how many posts you make in MaraTalk. Buy the traps you need here to try and catch a bug. Visit the trash heap for free once every 48 hours and see what you can pick up.